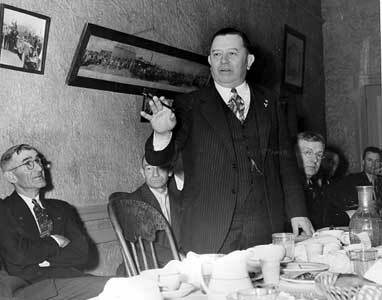 March 6, 1940 The very first TrailBlazers' Banquet and our first president, Paul Derkum. However, we first called ourselves the "Old Timers" The organization was founded in 1936 by A.F. Van Order, a Los Angeles area motorcycling enthusiast. The original requirement was that you have ridden motorcycles for at least 20 years. AF would round up fellow riders for informal sessions of bench racing. By 1940 it was time to get serious and schedule a banquet. 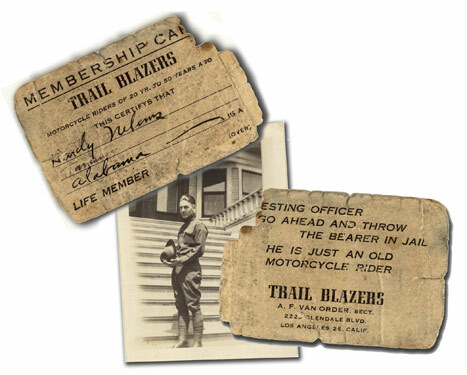 This maybe the oldest TrailBlazers' card in the world - issued to Hardy Nelems. Thanks to his son, Robert for sending this to us.